One thing I've recently realized is that I'm not so good at following up on projects I've mentioned on the blog. Eventually I post when I finish something but I don't really keep people up to date as I'm working on them. This is an element of my blog that I'd like to improve on, as I think progress/process is an interesting part of crafting. I finished my Potholder Pass 8 projects, which I mentioned I was working on in my last post. For the partner receiving potholders, I had make a circle of geese block but hadn't made the other potholder. 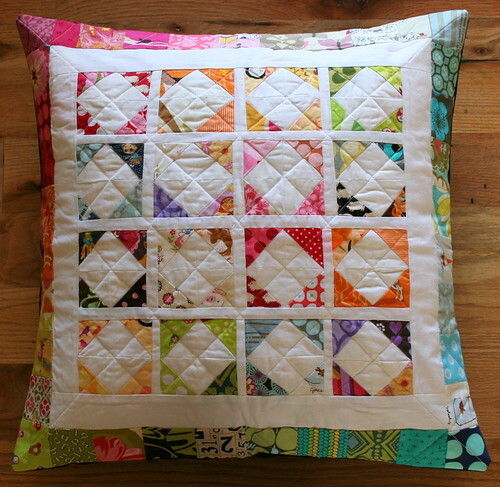 The other potholder was inspired by this beautiful pillow (photo below) from the Pillow Talk Swap. Wasn't Randi (i have to say) a lucky swap recipient? Here's my version of the square in a square and the finished circle of geese potholder, too. I decided to keep the rainbow theme for both potholders and used some lemon/orange fabric for the center square and backing. Quilting these potholders is really difficult because a layer of Insulbrite and a layer of batting make for a thick quilt sandwich. I used a walking foot and reduced the presser foot pressure to the lowest amount possible and I still find it really challenging. I don't know if anyone else has this problem in the swap or if it is just me? I had to redo the binding twice on one of the potholders because I misjudged how wide the binding would need to be to accommodate the thickness of the batting. Grommets/Eyelets--they don't explain very well on the Dritz kit package how the two pieces of the long shaft-thingy fit around the eyelets. After a few failed attempts, we finally figured it out. We? I had to ask my husband to help me hammer them in place. Oh well, I suppose Dritz can't do anything about my meager upper body strength. I'm really happy with how the eyelets look and I'll definitely use them again. I was swapping a bag with my other partner and I showed a photo previously of the completed Jane Market Bag. Here it is with a potholder I included in the package. I've also been a lucky recipient in Potholder Pass 8. My potholders came in the mail and I was so excited when I opened the package! Isn't this fabulous! 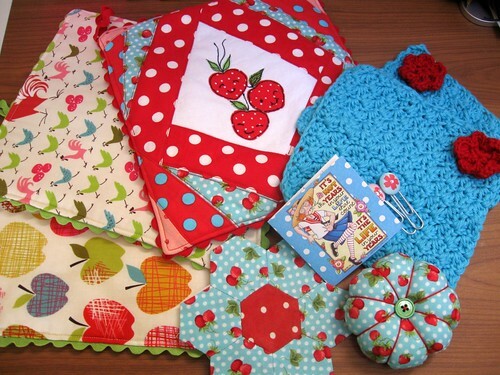 I love everything--the colors, the prints on the fabrics, the happy strawberries with faces (you know how much I like cute stuff), the pincushion, hexie and the cute little paper clips. And crocheted cloths with flowers? Seriously! I'm feeling so lucky and like I just had a second birthday. chloeandme is the best! Now I'm anxiously waiting for the grocery bag from my other partner to arrive! In future posts, look for updates on the One Block Wonder Quilt, my Lotus Tile Quilt, my green Cerisara cardigan and more! oh gosh, i love your interpretation of the pillows blocks! and the circle of geese is great too. 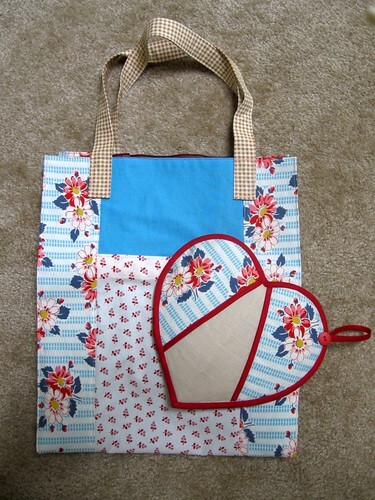 i have a jane market bag pattern, but i haven't used it yet. your adorable bag is quite inspiring! Pot holder turned out great. I have a few and never thought to use a grommet, but I will next time. Thanks! 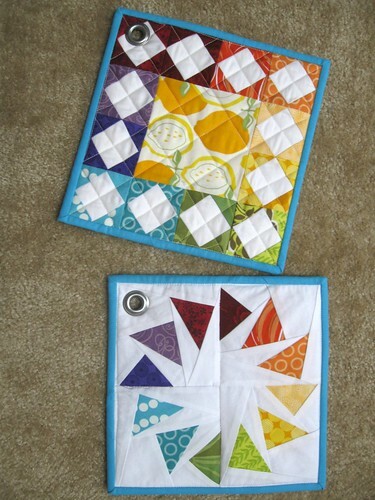 I hadn't thought to use the grommets either until I joined the potholder swap and saw other people using them. I definitely prefer it to making a hanging loop. Thank you so much! And thanks for posting your pillow from the swap, it totally inspired me! I think you will have a lot of fun making the Jane Market bag. It goes together really quickly and the instructions are excellent. I'm planning to make a couple for my mom next.